I had planned on leaving the hotel in Phitsanoluk no later than the mid-morning but the anguish in trying to find a suitable place to stay in Lampang is proving to be a major headache, and really should be far simpler for a place that inconsequential. The effort involves finding a place on Tripadvisor according to ratings, researching the hotels in greater detail, looking at the bed and breakfasts and specialty housing, checking out the listings in the Lonely Planet, then trying to map them, although most of the time the mapping functions on the hotel booking sites don’t work, and even Google Maps has difficulties with the composition of the Thai addresses. Not all locations are available, have rates displayed, or have enough reviews, then some have uninspiring photos or at least some reviews that are not just very negative but credibly negative. Attempting to bring up either traveler or professional photos represents another quandary. 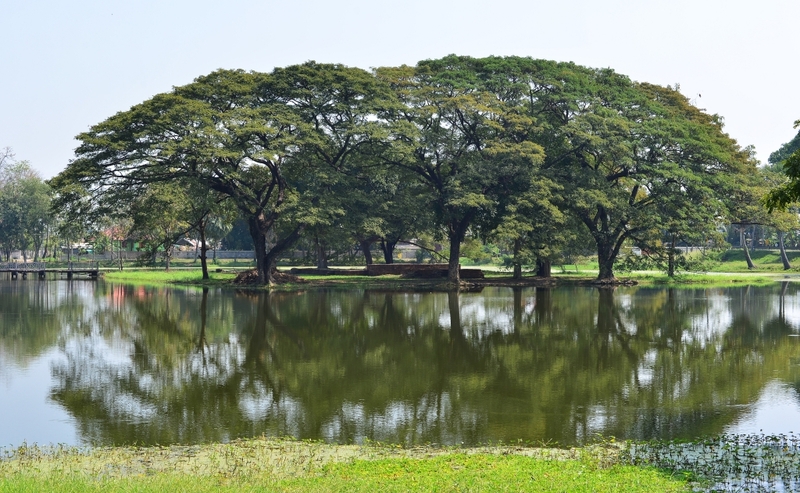 There are no bargains for Lampang – as with so many other places, the hotels that are inexpensive and good quality are far from the city centre, and the maps never indicate the street conditions that colour the quality of the walking experience to the ostensible attractions. The inflated prices also reflect the amount the Canadian dollar has dropped. When I finally book the hotel and try distilling the web page, Firefox freezes as usual and I end up having to reboot the laptop, which just seems utterly ridiculous. The walk to the bus station should have been simple enough but turns out to be far enough away with my heavy packs in the heat to be not quite as comfortable as I had wished. I am vaguely motivated to walk through yet another side street in town which could open up to reveal some curious local inflections, in the same manner as I have seen in other parts of the town, but it seems this phenomenon is not so apparent in this part of Phitsanoluk. The bus station is reasonably large, organized, clean, with none of the chaos and seediness seen in other Asian countries, the bus for Sukhothai’s new city leaving in half an hour. The air-con bus of elderly vintage departs virtually empty, allowing me to contemplate the uninspiring sun-washed landscape as well as the broader romance of traveling as the bleached scrub, raised wooden shacks, sugar cane and banana fields slide by. 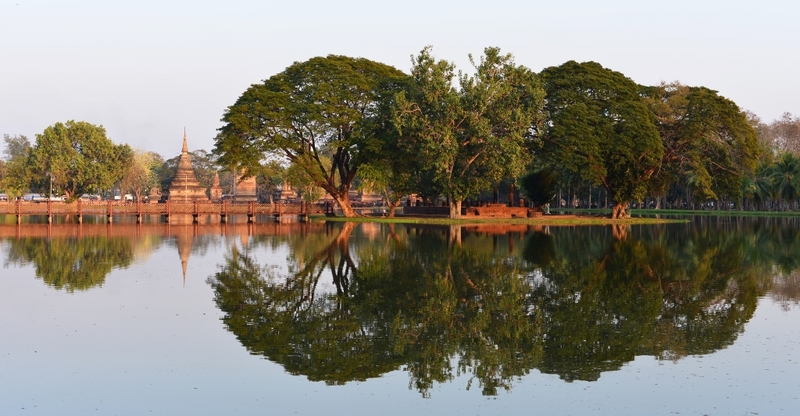 I am now thinking of traveling from Bangkok up to northern Laos after I return from Myanmar, doing a loop around northern Laos, then returning on land to Bangkok … although my plans will invariably change umpteen times by the end of the week. 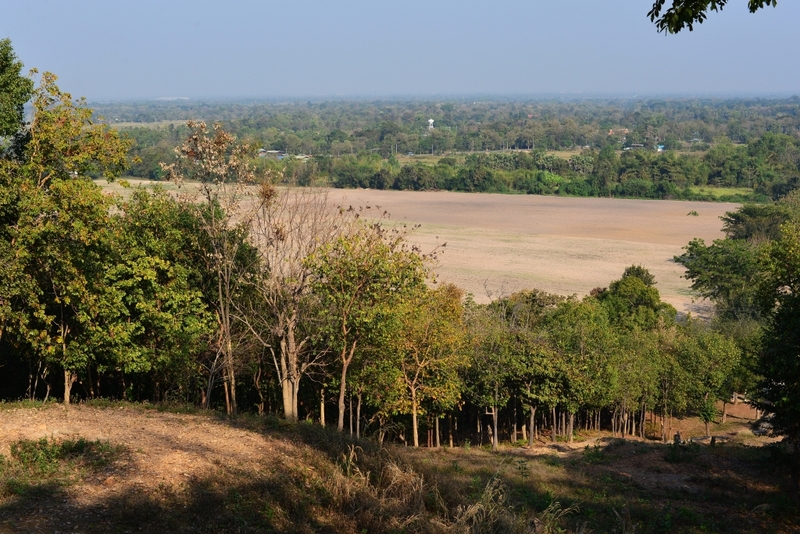 The bus station in new Sukhothai is even larger than the one in Phitsanoluk, with few passengers present, the green fields and odd commercial structures visible in the distance. From the very simplistic map that was passed on to me by my friends in Ayutthaya it would seem that the centre of town is relatively near the bus station, but it is in fact a long and punishing trek, something I soon find out with Henrietta, the lovely young Dutch woman from central Holland whom I team up with to walk to the centre of town. We pass enough cafes en route, but I have definitely had my dose of coffee today, and it is really showing in the degree of fatigue I am experiencing, carrying very heavy packs and walking the excessive distance. New Sukhothai looks – well, new, relatively affluent, with large retail spaces amended with workshops but no flagrant presence of tourist-related services – at least not at the outset. The Baan Thai guesthouse I had booked is very compact and prim. 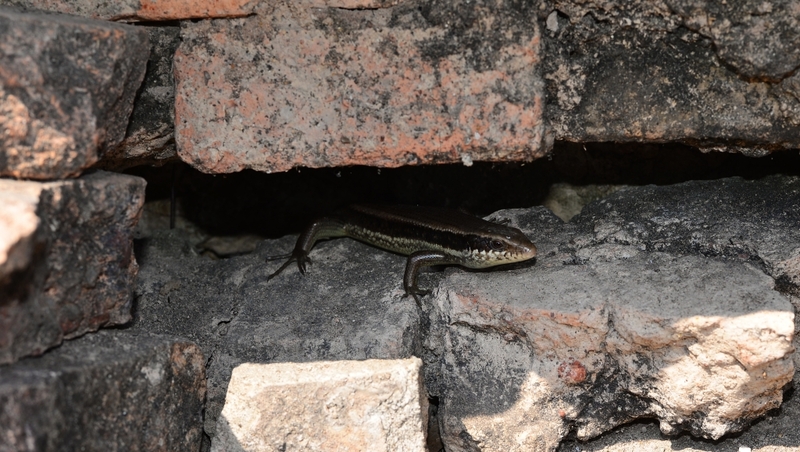 Just as much could be said about my bungalow, the term being very euphemistic, considering it is a small hut with a small single room, with only one functional window since the other one has no mosquito screen. The bungalow has functional air conditioning and wifi, a small bathroom and a large bed that fills up the better part of the space. With little room to move and even less to store my belongings, it will take some imagination to determine where to put all my things. 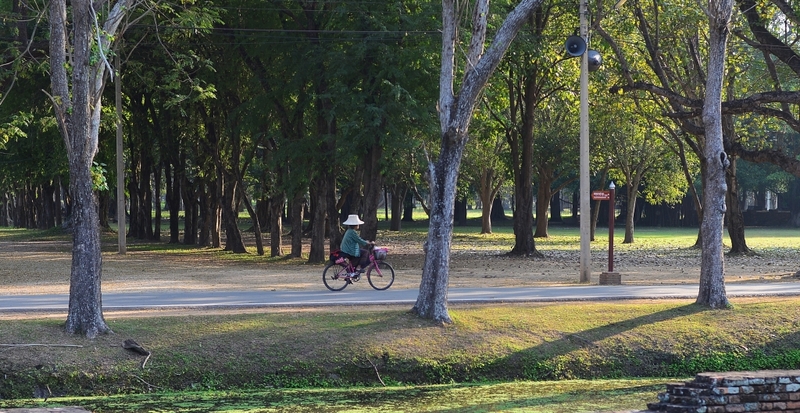 Henriette and I regroup, and then we are off again, flagging down one of the colourful old trucks with the rear flatbeds converted to seat passengers, then rumbling along the road towards Old Sukhothai, the air pollution palpable, even though we can see that the town is very small. 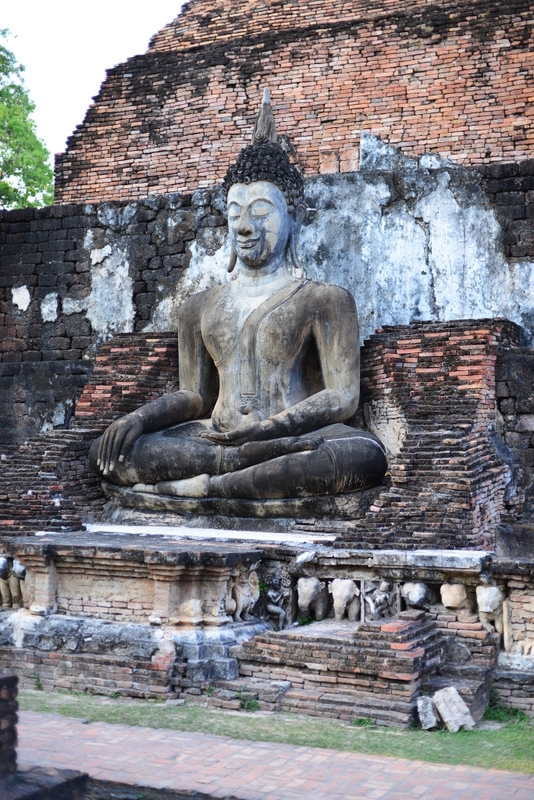 The driver inhales from his asthma inhaler, a large troop of uniformed children gets on the bus, and we continue at a crawl along the commercial and retail mix until approaching Old Sukhothai. Luxury resorts that are entirely outside my travel budget emerge – not that staying there would in the end change much of the experience of visiting the country. Henriette continues to tell me about how disappointing it was going to Pai. She had heard so much about the place, and that so many travelers were there, but in reality meeting interesting people when traveling is not so simple. Smaller, more off-beat places garner travelers who are more interesting, experienced, charismatic, while the places that are too popular will just attract the herds pursuing the same gated, cookie-cutter experience. And Thailand’s beach resorts would be hideous places to meet interesting people, as they are veritable tourism assembly lines. 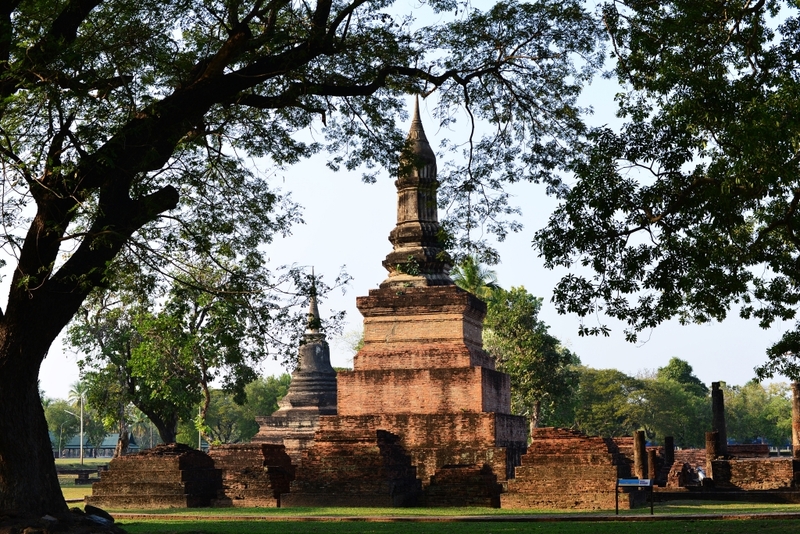 No urban settlement is visible from Old Sukhothai, which is essentially just a few blocks of green on either side of the Wat Mahathat, easily the first destination on our itinerary. 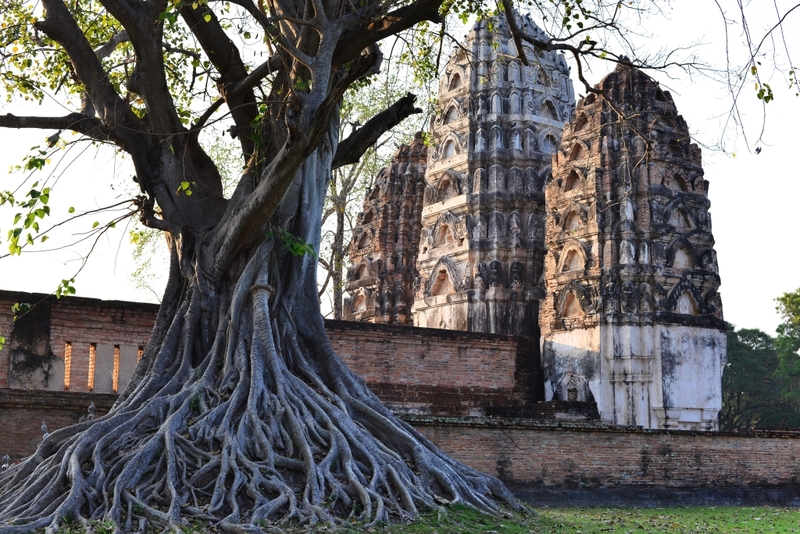 Wat Mahathat is the dominant religious structure in the old city, dating to the late 13th century and the principal sacred structure of the Sukhothai kingdom. It was created to house relics of Buddha, the central stupa in the shape of a lotus bud, girdled with images of disciples. 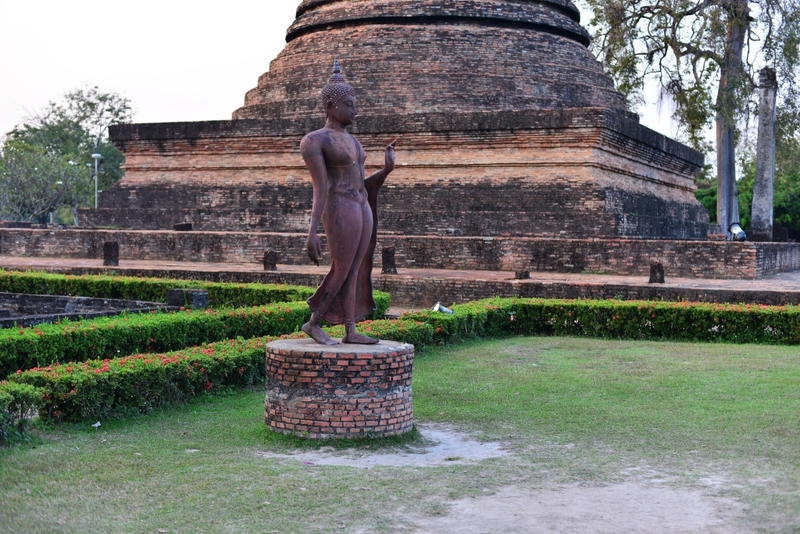 Encircling this stupa are eight lesser stupas containing smaller images of Buddha complimenting two 9 metre statues of a standing Buddha, in addition to 10 viharas and 200 secondary chedi. 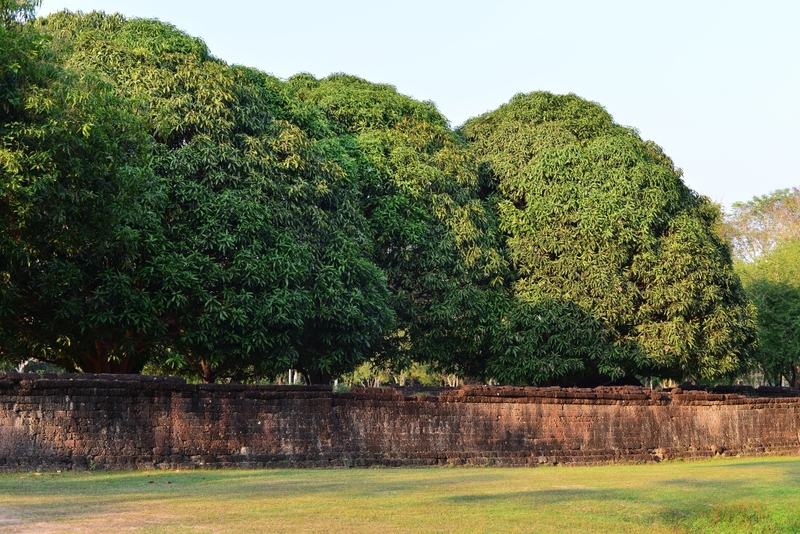 As with many other temple complexes, the site is surrounded by a brick wall and a moat. 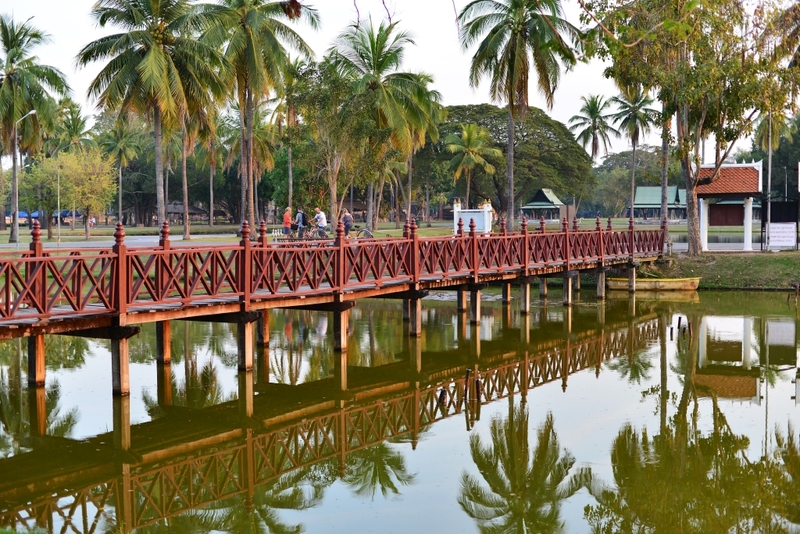 A smattering of awe-struck tourists wanders through the stunning temple remains, its power underlined by its intactness, and the rich tapestry of green and low flowering bushes that embellish the grounds. 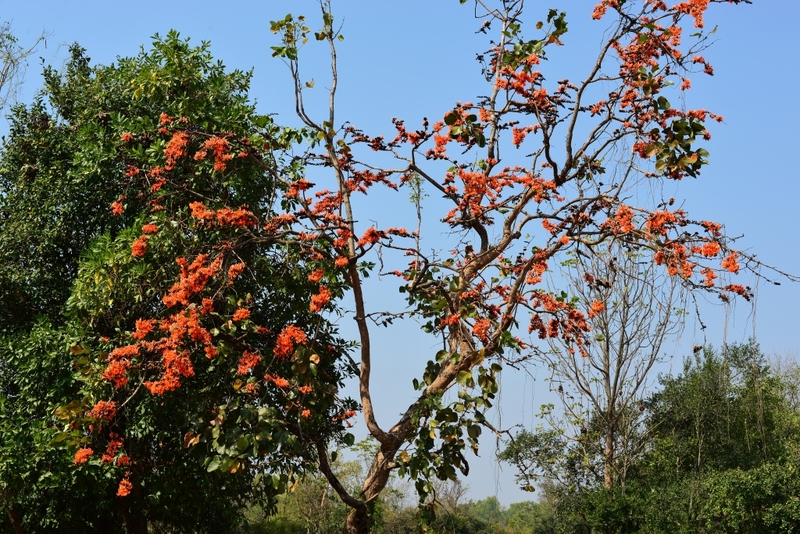 We continue on one of the roads that demarcates the temples laid out amongst the massive tree canopies, the weathered cream structures shimmering in the late afternoon light against the backdrop of rich forest green. 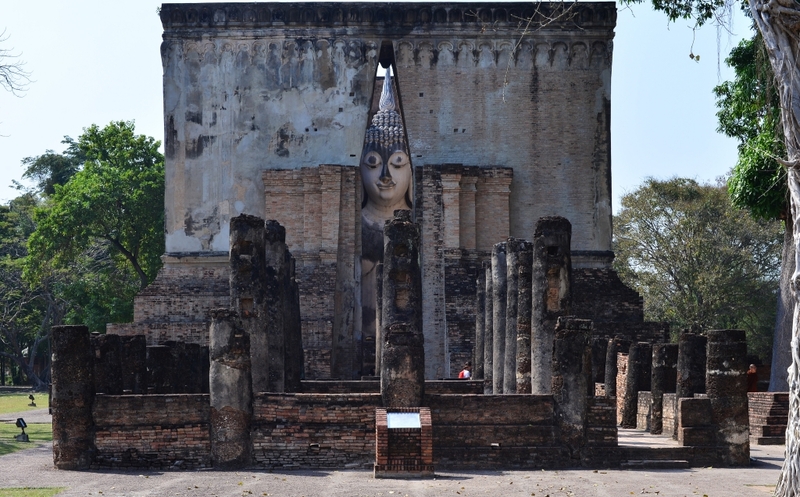 Wat Si Sawai is our next destination, the three towers originating as early as the 12th century, and reflecting the Hindu tripartite of Vishnu, Brahma and Shiva built in the Lopburi style, also walled and encased in the remains of a moat. Only a handful of visitors are present as we navigate the site on foot. Leading up to the prang from the main entrance are the columns which would have supported the lengthy vihara in early times. 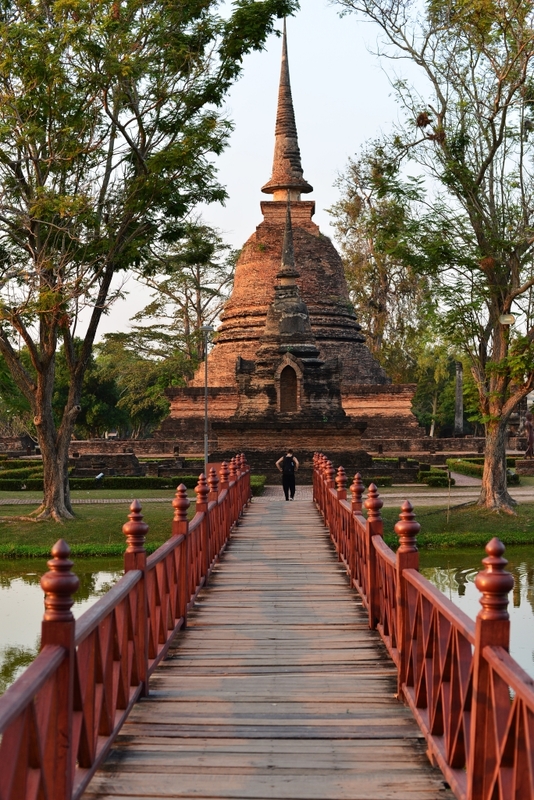 Our final destination is the Wat Sa Si adjoining a larger lake adorned with picturesque flowering lotuses, the chedi fronted with the remains of a vihara, a seated Buddha governing from one end of the platform on which it was erected. 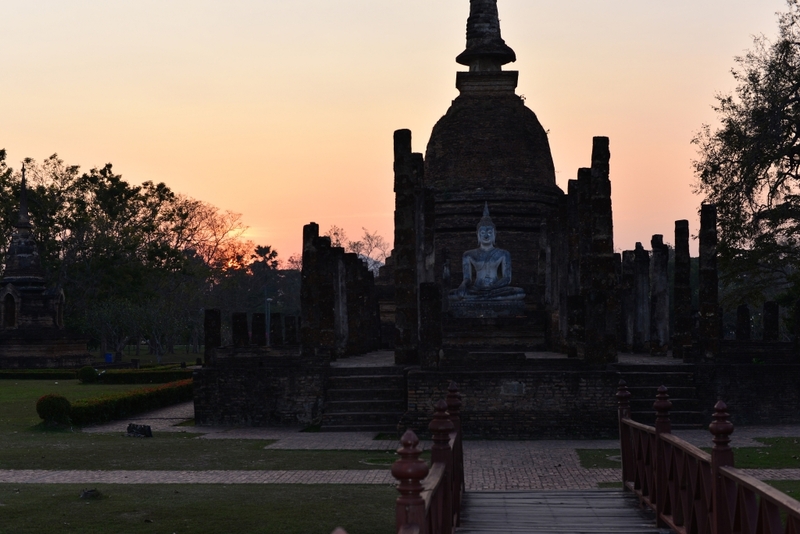 Little time remains for us to take in Old Sukhothai, since the light is falling, and we will soon have to return the bicycles to the rental, as it closes at 7 pm, never mind having missed the last bus back to the new city. But the allure of possible sunset shots awaits, not that there is much chance in this hazy light. 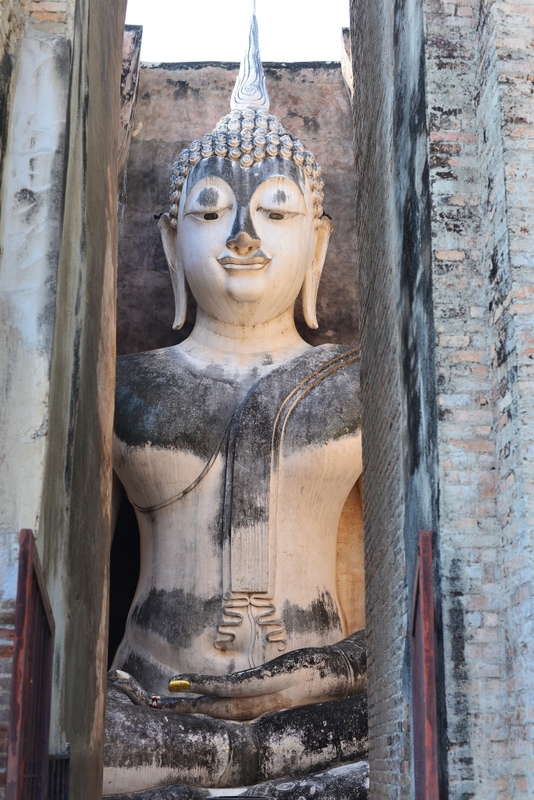 I try my luck at Wat Sa Si, while Henriette is apparently less lucky at Wat Mahathat, but no matter, the short visit here has been really incredible, and we are looking forward to coming back here and seeing much more of the surrounding area tomorrow. The bicycles returned, we wander along the strip of restaurants emanating along the road towards new Sukhothai, on one hand wanting to partner with any travelers intent on returning to New Sukhothai so as to drop the cost of the tuktuk, and at the same time recognizing that the eateries here probably represent a far better culinary opportunity than anything offered in the market of New Sukhothai. We page back and forth through the menu of one, the conversation flowing on all manner of subjects, from the state of the European political economy to the joys of traveling, the Chilean couple seated behind us joining in, off on the late night bus to Cambodia with the idea of reaching Siem Reap by tomorrow, capping off their short trip through the region with some of the mandatory highlights, something Henriette is also dreaming of, but then it is her first trip through the area, and you just can’t do everything at once, can you! Our excited chatter continues as we share travel stories on the tuktuk puttering along the highway now enshrouded in darkness towards the new town. 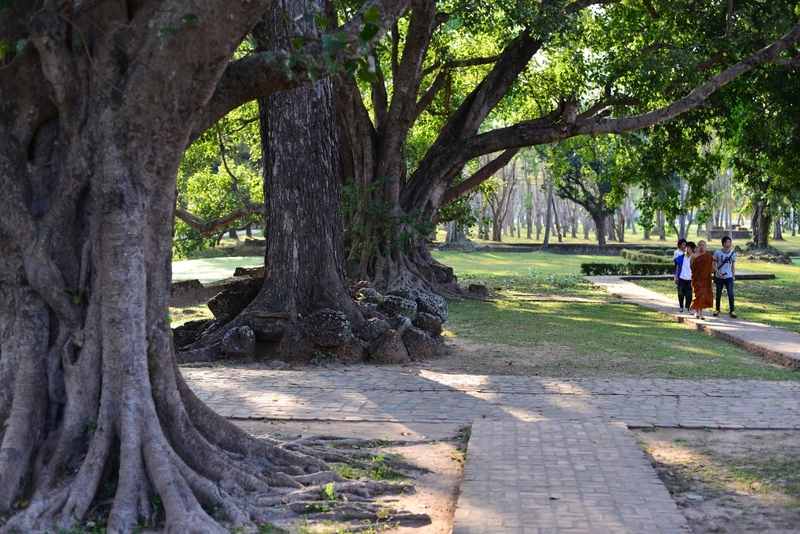 Crawling out of my very confined bungalow into the almost embarrassing intimacy of the lodge grounds, the idea of privacy shrunk to an excess to accommodate the lowest of budgets in this narrow strip of land jutting out from the new town, a profoundly tepid counterpoint to the old city of Sukhothai. And yet I would hardly call out this town for its aethetic transgressions, given what the average town in Thailand looks like. 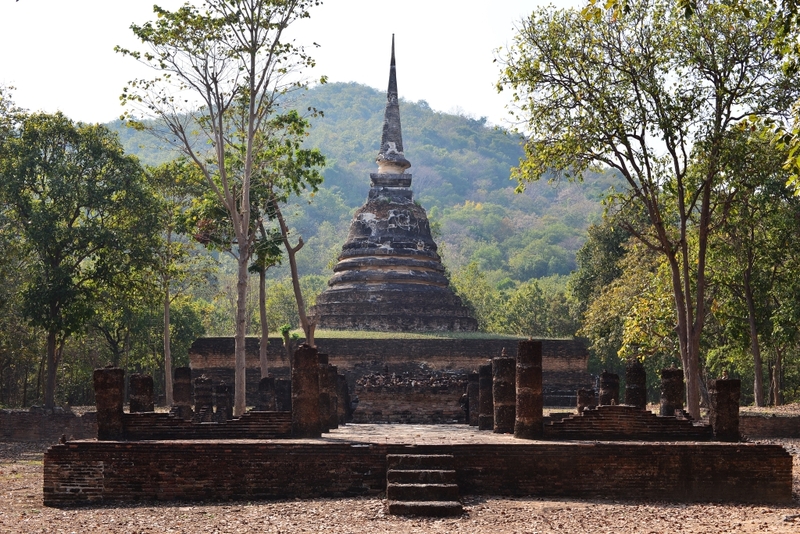 Today’s plan involves visiting the outer temples of Sukhothai, which hopefully should be containable within the late morning to early afternoon, although as usual, I start later than I had intended, and dwell far too long at each of the admittedly quite minor sites. The usual Asian breakfast takes me out of the way and on a quick foray into the drab new town, prior to climbing onto the shuttle bus to the entrance of the old city. The bike rental places are lined up next to each other right by the entrance. It seems that everyone goes to the bike rental place closest the main entrance, and not to the one next door, which of course compels me to give me business to the least busy of the lot, not that their bicycles are any worse than their competitors. Not that anyone’s bicycles here are that memorable, the tiny frames ideal for blowing out the knees of oversized louts such as myself. 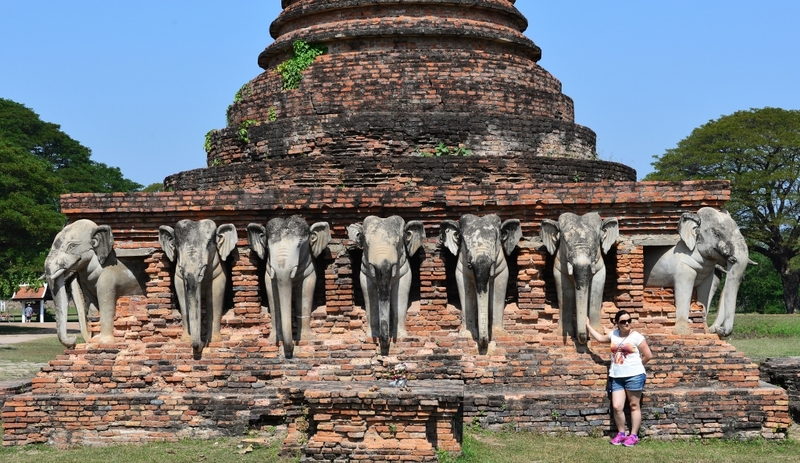 Trundling along to the outer temples using the obscure icons on the tourist map as guide, the first stop past the canal is the remains of the 15th century Wat Sorasak with its regularly-spaced elephant heads guarding the base of its lone stupa. 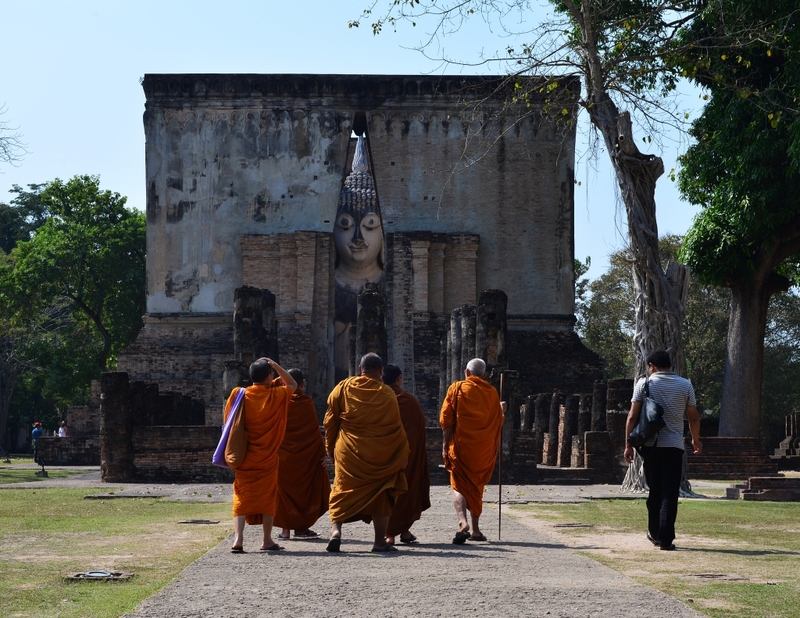 Phra Pai Luang is somewhat more impressive, with exposed ruins of a terrace culminating in several seated Buddha statues, stone sentinels seated on their sedate outposts, if anything a tribute to the possibility of memorializing the trip to Sukhothai by means of alliteration. 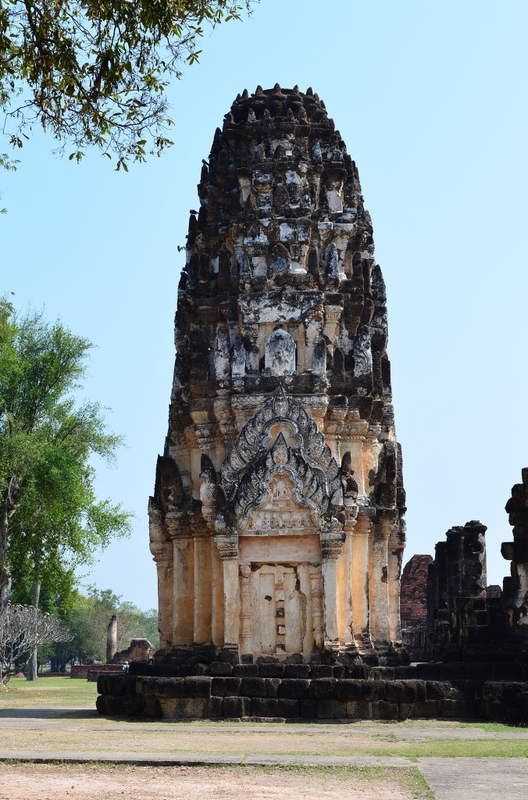 This now modest temple was apparently once the ritual center of Sukhothai and the biggest temple in the city area, built in the late 12th century during the reign of Jayavarman VII when the city was still under control of Khmer. Poorly patched and slightly tilted stone columns line a plaza that would have once been an ordination hall, somber stone remnants organized in strict geometric order with the deceptively pleasant park land serving as backdrop. 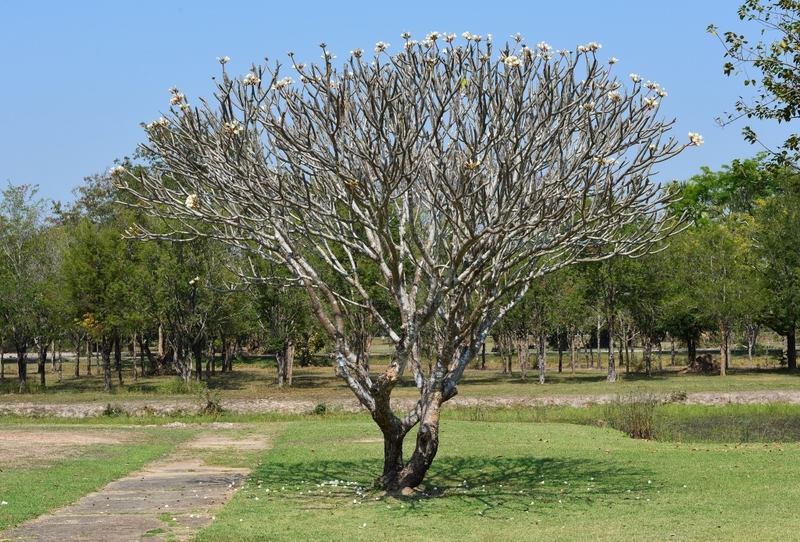 Adjacent the single mouldering remaining prang stand the meager crowns of cream-coloured flowers adorn the crest of barren frangipanis, a paean to life next to the stone rubble. 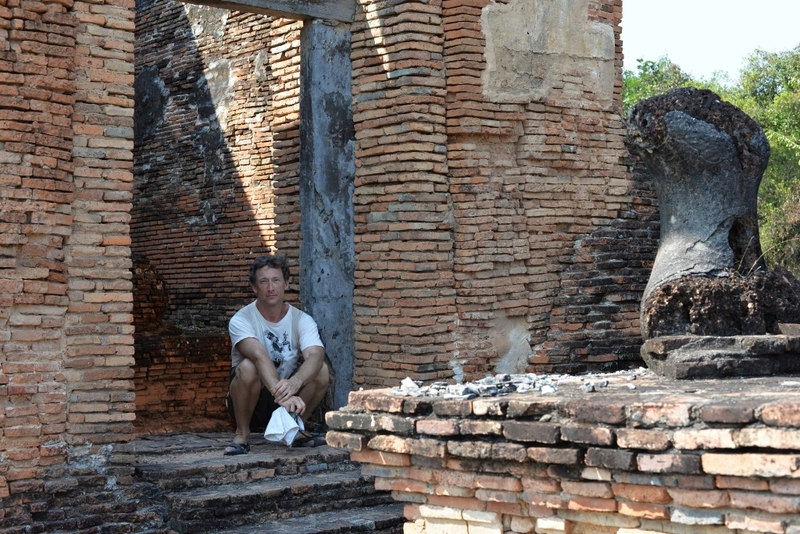 Joining forces with Matthieu and Ping at Wat Sri Chum, the former agreeing to an in-depth review of the entire ring of archaeological sites bordering the outer fringe of the old city, while Ping would rather catch the highlights and enjoy the rest of her day otherwise. 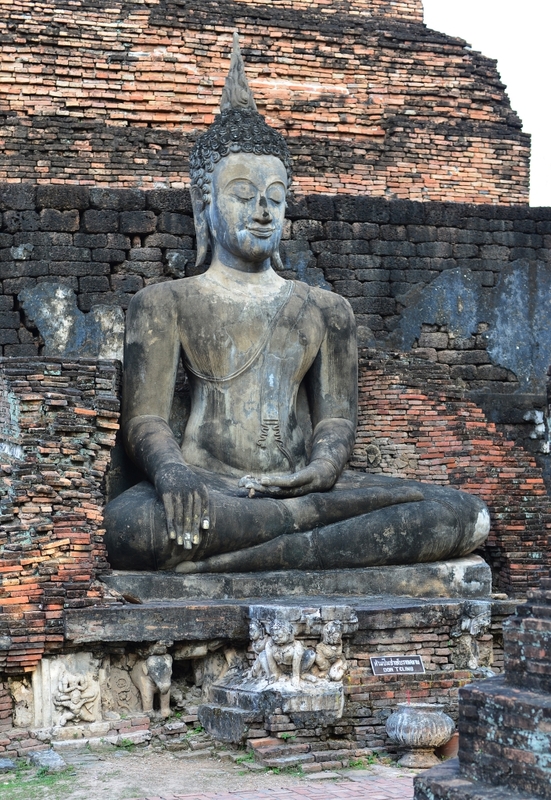 Wat Sri Chum features an enormous mandapa built in the late 14th century, inside of the claustrophobic space a 15 meter tall seated Buddha, the massiveness of the representation intended to stun the visitor approaching from the distance along the wide passage to the narrow opening. 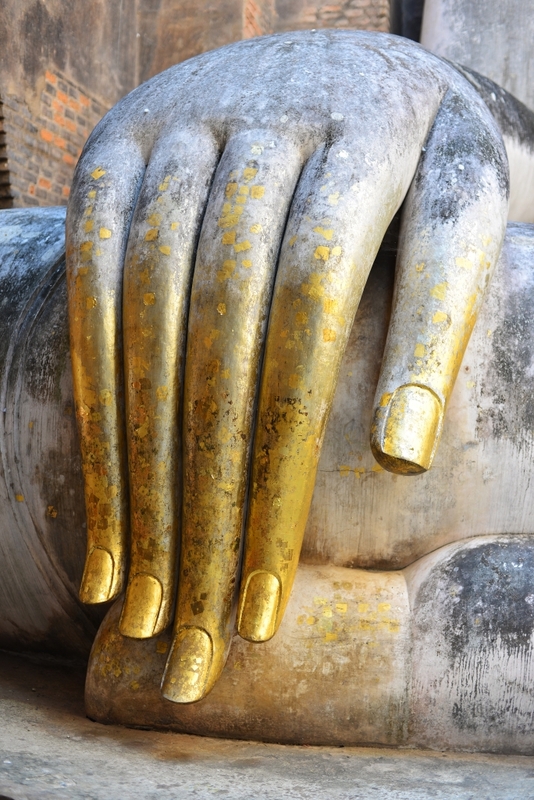 The muddled tone of the body gives way to the flecked gold of the lowered hand in the Bhumisparsha mudra, the fingers reaching towards the earth symbolic of the moment of the Buddha’s enlightenment. 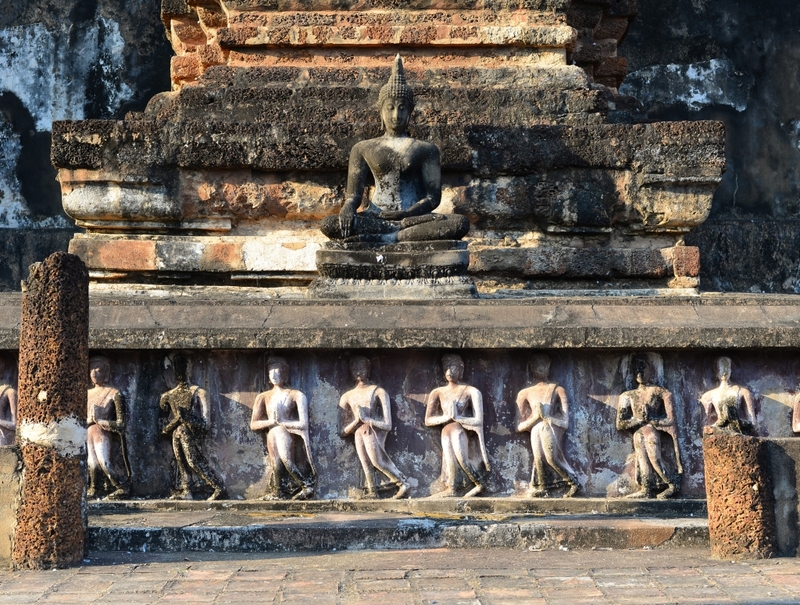 In the adjoining staircase more than 50 slates were found with images from the life of Buddha, the oldest surviving examples of Thai illustration. Tall hardwoods provide some shade in the building heat of the early afternoon. 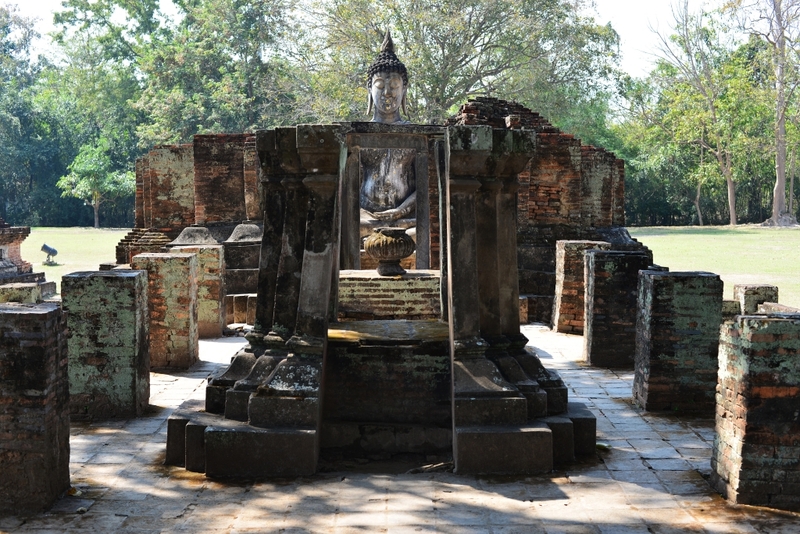 wat Tuk is similar, but on a smaller scale, a smaller columned plaza, originally an ordination hall, leading up to an intact – or at least restored – mandapa with a small beheaded effigy of Buddha. Wat Pasak follows, even less significant, its columns the only remains of an ordination hall, the small site surrounded by sets of mirrored stone slabs set at regular intervals. 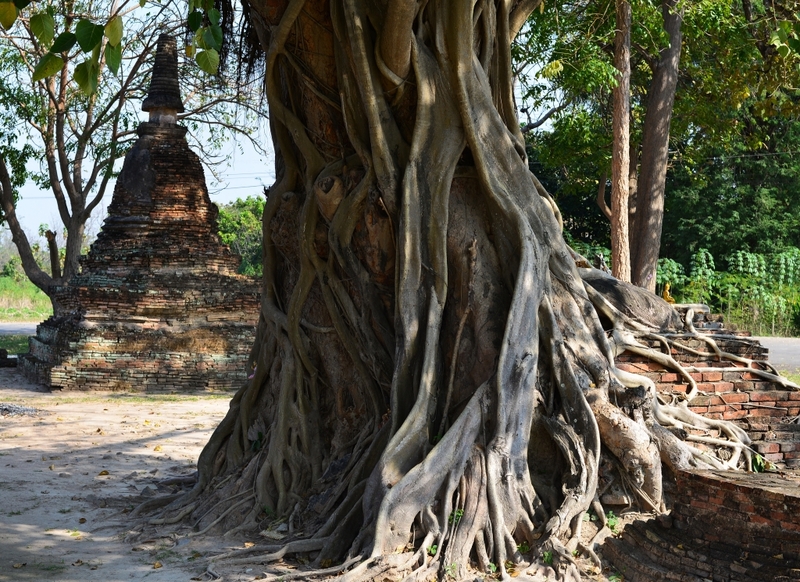 The demise of the modest stupas at Wat Mangkorn becomes more dramatic as they struggle to evade the sinuous strangling tentacles of the ancient ficus trees. Somewhat longer in dimension, Wat Tham Hip Lang’s columns stand erect on a raised platform further towards the hills, and finally, just before the land rises up from the boiling heat of the plains, the Sri Lankan-style stupa seated in the centre of the modest base framed against the lush green erupting above. Just when the heat has reached its apogee, we are obliged to climb up the low mountains to reach the last of the ancient temples, Mathieu racing ambitiously to the top while I stumble up from behind, questioning my sanity. 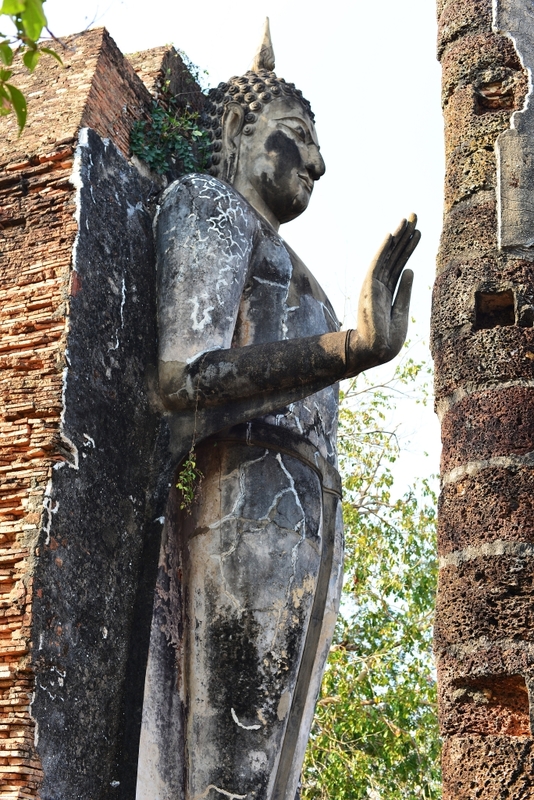 A 12 ½ meter tall standing Buddha is framed against the remnant of a stone wall, gazing sternly over the arc of trees rising from the plains below. I take a plethora of photos of the temples en route, but I can’t muster energy for much more. The humidity may not be excessive but the heat is taking its toll. I feel filthy and bedraggled from having hiked and cycled in the heat all day, my daypack totally sweated through. I really would love to get back to the hotel and start writing, eat, and just become a civilized person again. The eventual return to the claustrophobic confines of my bungalow offers some relief, at least in terms of an ability to lie down, turn on the tepid air conditioning, and best of all, be online again. Observing the thicket of occupied tables at one of the backpacker hotspots on the main road in the vicinity of my budget hotel, I see Ping waving to me. I don’t recognize her at first, as I thought she worked in the restaurant. I sit down across from her, happy to finally put the day to rest, not be overwhelmed by the heat, and best of all, enjoy her company. Our conversation runs the gamut of subjects but ends up weaving into a semblance of Louis Malle’s ‘My Dinner with Andre’. She mentions how traveling triggers synchronistic experiences for her, which of course unleashes a similar torrent on my part, waxing tritely about experiences that just seem too coincidental. We progress to the problem of economic development at the expense of cultural integrity, a challenge so much of Southeast Asia faces. My passions rise, while she demurs, telling me how little she has seen or done in her life. And yet her protestations turn out to be anything but true, as she has done humanitarian work in different places in Southeast Asia, most recently in the area of Mae Sot, even though she has a day job of urban planner in Singapore. She had visited Spain and was taken by the passion and intensity of the country, particularly Madrid. Every trip she took simply motivated her to see more. And despite the fact that Singapore is a glass cage she is perfectly placed to see all of Southeast Asia, although most of it is considerably messier to take in than the western countries she has also grown to love. The restaurant eventually fills with a flood of westerners from retirees to backpackers, mostly Germans and French. We talk about the incredible degree of freedom and randomness to explore the world we enjoy, and that despite endless places to visit sometimes our trajectories do inexplicably coincide. I mention how incredible it is to be able to maintain relationships with people you meet traveling all over the world by means social media. The food is surprisingly good and modestly priced, with diversity of offerings typical of most of the local tourist restaurants. And yet being surrounded by the ubiquitous young Europeans living out their dreams while so many locals can barely eke out a living seems a lot to stomach. I had wanted to go to the night market to buy some snacks, but the adjacent takoyaki stand will do admirably. I will just have a quick drink at the neighboring bar to make some notes in my journal, admirable intentions, if anything. And finally, at the end of a long day, my claustrophobic but cool room at the Ban Thai guesthouse awaits. And the modest guesthouse is in fact full tonight, not surprisingly, considering its rating on Tripadvisor. 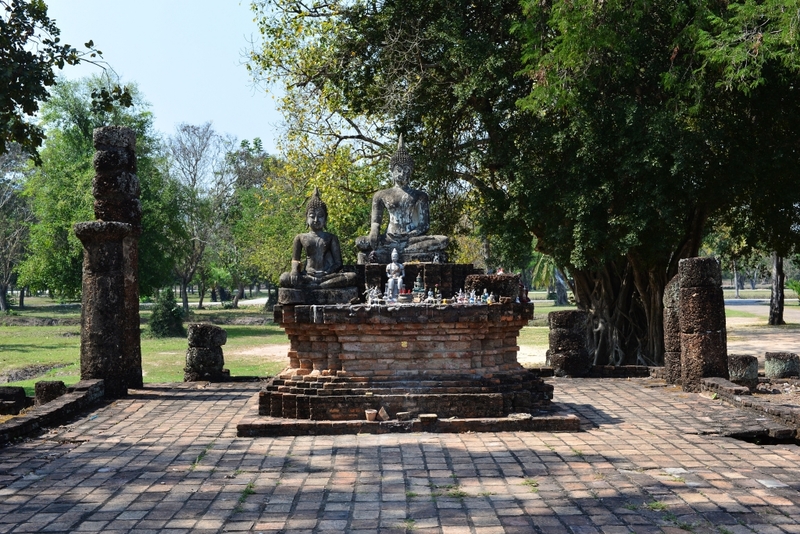 And yet, while it is inexpensive, it is nothing like the Old Palace I stayed in Ayutthaya in terms of the room, the grounds, and the surrounding area.